In the late Mesolithic era unlike most of Eastern Europe, where the population still led their traditional way of life of wandering gatherer-hunters, the hunting, gathering and fishing had lost weight in the economy of the Northern Black Sea region due to the nature of the steppe landscape. The creators of the local Kukrek culture, without leaving the traditional forms of management, begin to use domestic large horned and small livestock Meadow vegetation in in the steppe provide good forage for livestock, so a small population there had no need to turn to agriculture. However, the cultural flow penetrating from Anatolia to south-eastern Europe through the Aegean space introduced important changes in the economy of Eastern European population. They connected beginning of the local Neolithic with this process. In the steppe of Black Sea coast between the mouth of the Danube and the Ingulets River, sites of Hrenennyky culture based on economy of hunting for a tour and a horse. The genetic roots of this Late-Mesolithic culture lurk in the Balkans. In contrast, the other Late-Mesolithic culture, Janislawice, common in Poland, between the Vistula and the Niemen Rivers, has its roots in western culture of Late Maglemeze. Sites of this culture reaches Dnieper basin (ZALIZNIAK L.L. 1995-3: 6-8). 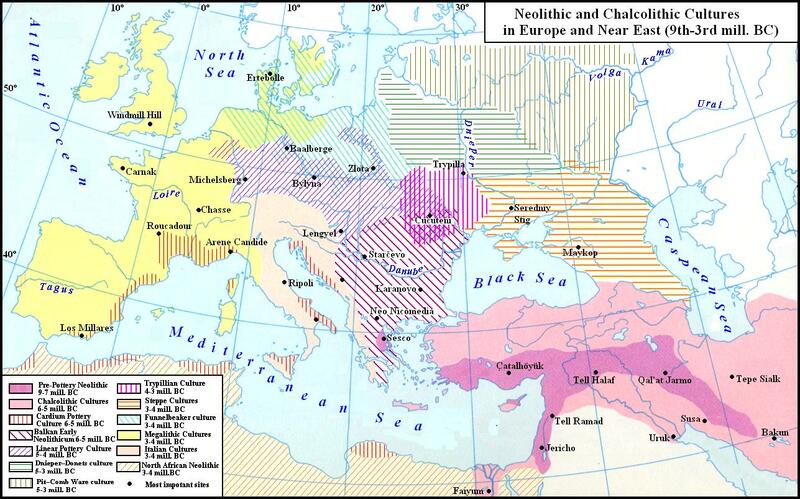 Spreading Neolithic and Chalcolithic cultures from the Near East through the Balkans and Caucasus into Europe.. The map is compilated on basis of "Atlas for History" [BERTHOLD LOTHAR (Leiter). 1973. 4.II]. The map gives overview of the spread of the Neolithic and Chalcolithic cultures from the Near East through the Balkans and Caucasus into Europe. In the VI mill. BC there was a number of individual cultures on the Balkan peninsula and in the region of the lower Danube which had common Near Eastern roots. The first farmers and herdsmen came to the area from the Dniester River till the Lower Don from the south-west, and partly, perhaps, from the Caucasus (BROMLEY Yu.V., 1986, 292). Actually, these newcomers were the creators of the first Neolithic cultures in Eastern Europe. During their spread in the direction to the Carpathian Basin in the 5th mill BC, when farming and pastoral tribes were first settled here, occurred gradual transition from the Mesolithic to the Neolithic (HERRMANN JOACHIM , 1982, 43). … large process of neolithisation of the Right-Bank Ukraine by Balkan-Danubian migrants was was started by Grebenyky people mid VII mill. BC, which stimulant could be likely transgression of the Black Sea. The moving speed of Neolithic settlers to the Right-Bank Ukraine was largely depended on that, what was the onset of the sea – a sudden or gradual. That is, if it was intensive migration or gradual infiltration among the local hunters and fishermen, but future research, including the Black Sea transgressions may answer (ibid, 11). Migration of Proto-Neolithic and Early-Neolithic population during the second half of VII – beginning of VI millennium BC., maybe partly stimulated Early-Atlantic transgression of the Black Sea. Original of the map (ibid, 10. Fig. 4) was colored by the author. 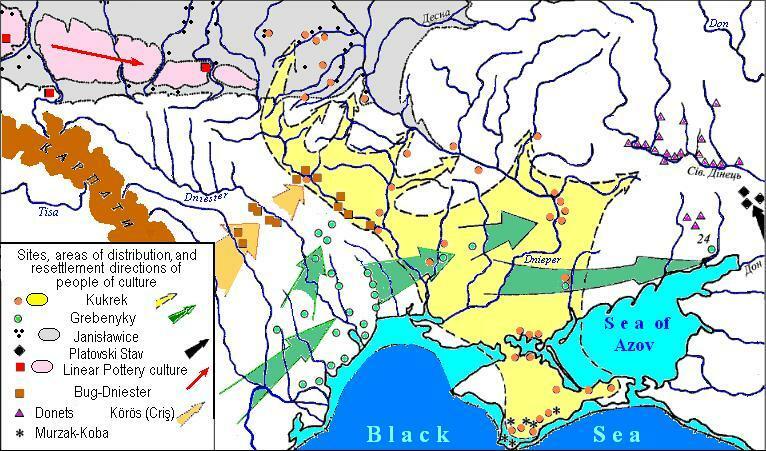 The dark blue color shiws waters of the Black Sea in the early Holocene, blue is flooding land. 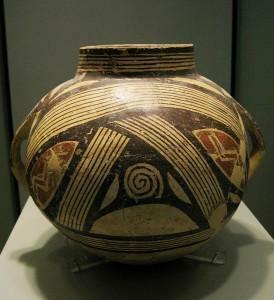 The newcomers created several interrelated Neolithic cultures on the Middle Danube belonging in general to the circle of the Linear Pottery Culture which originated in the area of the Carpathian arc and spread to large parts of Europe until France. The earliest of them, Körös culture, was created by people of southern Balkan origin (SHUSHARIN V.P., 1971, 12). This culture together with sites of Starchevo and Karanovo formed the cultural and historical area of early Neolithic (see maps above). Further the Neolithic cultures on the Balkans have been developed in Vinča culture (VI – V mill. BC), one of its variants or a branch was been Dimini culture (Thessaly, Greece). Before that, some group of newcomers had created the Bug-Dniester culture, which could have connection with more advanced synchronous cultures of South-Eastern Europe. Mykola Tovkaylo supposed that after establishing contact with the culture of Körös in the the outsets of productive economy i.e agriculture and livestock (TOVKAYLO M.T., 1998, 1). However we can also assume that the elements of the new management have been made not only by simple contact, but together with the relocation of the Balkan population to the Steppe Bug region. The Bug-Dniester and Early-Typillian cultures coexisted in the same area and maintained close relationships during a long time from the middle of the 1st to start of the 2nd quarter of the 4th BC (TOVKAYLO M.T. 1998, 14-15). At the same time (in the 5th mill BC) Neolithic cultures spread through the South and North Caucasus to the eastern part of the Ukraine (the Dnieper-Sura and the Dnieper-Donets cultures). This spreading was occurred by as resettlement and partly by borrowing the productive economy. Creators of the Dnieper-Donets culture were Indo-Europeans which migrated in the Dnieper basin from the Caucasus. The basis for this assertion is almost complete coincidence of the distribution of this culture with Indo-European area determinated using the graphic-analytical method (see the section The Indo-European Tribes). A significant part of the Steppe cultures, in particular the Seredniy Stiğ and Yamna (Pit) Cultures should be associated with the ancient Turks, which followed the Indo-Europeans The Türkic Tribes). Finno-Ugric and Samoyed peoples were creators of Pit-Comb Ware cultures in the Volga basin and its right tributaries The Finno-Ugric and Samoyed Tribes). Usually the last cultures are also referred by scholars to the Finno-Ugrians, while the the Seredniy Stih and Yamna (Pit) cultures are connected with the Indo-Europeans. On this view, the question arises, who created the Dnieper-Donets culture then? Its carriers could not disappear without a trace or to be assimilated by creators of Corded Ware culture, as it had place in case of cultures of Central Europe, because no sites of CWC were found in the places of distribution Dnieper-Donets culture. This problem is considered in details in the section Ethnicity of the Neolithic and Eneolithic cultures of Eastern Europe. It is not excluded, that the territory of Central Asia was transformed into a semi-desert in connection with aridization. Living conditions deteriorated sharply, what resulted an outflow of population northward in a more favourable habitat. This area could be the Forest-steppe and the Volga region. Alien populations mingled with the natives and could borrow the local tradition of making stone tools (TURETSKIY M.A. 2007, 53). Demographic expansion of farming communities from the Southern Caucasus and Anatolia to Eastern Europe could be due to a relative overpopulation in their primary habitat, or rather by achieving so-called "maximum of the economic function", which determine the border for population growth in a certain area, occurred not only in natural way but also due to the retracting of small farming communities of neighbouring groups (ARUTIUNOV S.A. 1982: 72). Coexisting on the same area and maintaining the long-term close relationship, Bug-Dniester culture and Early-Trypollian gradually bring together their economic systems, reaching close to the level of economic development. (TOVKAYLO M.N. 2004: 38). The study of prehistory of humanity helps us better understand the causes of armed conflict which are so often today.